March Madness isn’t just for basketball fans… we’ve got a game for fabric lovers too. Our Painter’s Palette Solids collection contains 168 mouth-watering silky smooth colors, and we’ve asked sixteen quilters to each curate a palette of eight fabrics. 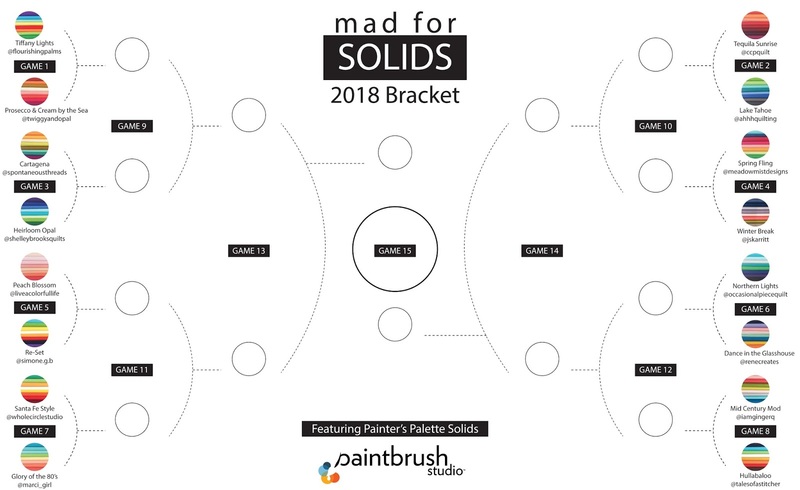 We’ve placed the sixteen curated palettes into a bracket. Each day we’ll post a “game” in which two brackets will compete. Vote for your favorite on Instagram, Facebook, and Inspired by Fabric (one vote per medium per day, please). The palette with the most votes each day advances. Besides helping your favorite palette advance, why should you vote? We’ll randomly select four winners from the championship game voting to receive fat quarter bundles of the winning palette. 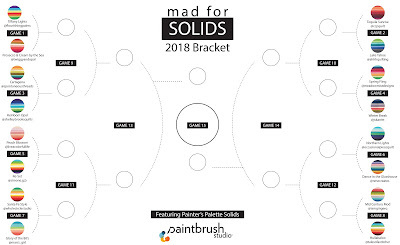 Help your favorite palette advance all the way to the championship game! This bundle is inspired by the colors found in two stained glass color wheels made by the famous designer and artist Louis Comfort Tiffany. These interlocking wheels were placed at the base of a fountain, and as water filled and flowed out of the fountain, the water was infused with an ever-changing rainbow of colored lights. I’ve always wanted to design a quilt around the soft range of colors from a sunset, tequila sunrise was born out of this desire but constrained with the guiding influence of choosing colors that I do not typically work with. Orange has always been a difficult color for me to embrace but so many influential people in my life live in these vibrant warm tones. My bundle was inspired by a photo I took while visiting Lake Tahoe last fall. The photo was of a row of colorful paddle boards lined up on the shore near a dock. I chose all the colors directly from the paddle boards, beautiful shades of blues, green and gray. For this bundle, I was inspired by the changing seasons to create a fun and colorful bundle that is perfect for spring. My bundle is a collection of colors I associate with the transitional time from winter to spring, dormancy awakening to life again! We recently watched a movie about surfing in the Arctic's icy-cold waters, with stunning shots of the Northern Lights. I've always wanted to see the Northern Lights, and am fascinated by their cool spectrum of color. My bundle is inspired by a recent visit to the Chihuly Garden and Glass in Seattle, Washington. I was enthralled with the colorful glass art objects in the galleries as well as in the outdoor gardens. Photographs cannot capture the brilliance of the exhibits, though I certainly tried. I was fortunate to experience the gardens during the day as well as in the evening after dark. If only their Dance in the Glasshouse program was available during my visit; instead I’ll create my own Dance in the Glasshouse quilt with these luscious Painter's Palette solids. I recently travelled to the high desert of New Mexico to visit family. I never imagined how peaceful and beautiful the area would be. Everything about the area is spectacular — from the landscapes to the handcrafted items, including pottery and rugs. My inspiration for this collection is the color palettes I discovered during my trip. She wore a dress of shell pink, applied her salmon lipstick and arranged a flower her pale silver hair. She sipped from her lemon ice as she waited for Poseidon, watching as the setting sun cast a green sheen over the pale aqua ocean. Hullabaloo means uproar or commotion which is certainly part of March Madness and this color palette. I wanted to use colors that challenge traditional notions of what goes together in a quilt. I also wanted to create an underdog—a palette that just might take the brackets even though at first look it appears that these fabrics would never play together let alone make a champion team. See you Sunday for Game 1 voting! They're all lovely, but I especially like "Glory of the 80's"
Tiffany lights & northern lights are my favorites. Another fabulous March Madness playing field! Gorgeous bundles...it'll be a tough one! How am I going to choose? Three of these bundles were curated by blogging and bee buddies! Hard to choose, but it would be Northern Lights. Thanks! Nice combos- I like Tiffany Lights. How does the "voting" work? Prosecco & Cream by the Sea is my choice for Game 1. So fun to see these all together, and to read the quilter's statement of inspiration. Thank you!! Tiffany Lights is my favorite. Procecco and cream by the sea! I love the Lake Tahoe palette! Heirloom Opal Please! All are beautiful! Stiff competition to be sure!!! I love PBS March Madnes!!! I vote for Northern Lights. Northern light gets my vote. But they will all make terrific quilts!